Learn about SASS's writing, tutoring, supplemental instruction, Structured Study Program, and study skill development services. SI is a free academic assistance program provided by Student Academic Support Services that uses peer-led group study to help students succeed in traditionally difficult courses. Study sessions are facilitated by SI leaders, who are peer students and have previously completed the targeted course with demonstrated competency and a faculty recommendation. The SI leader attends class sessions as well as leading out of class group study sessions. 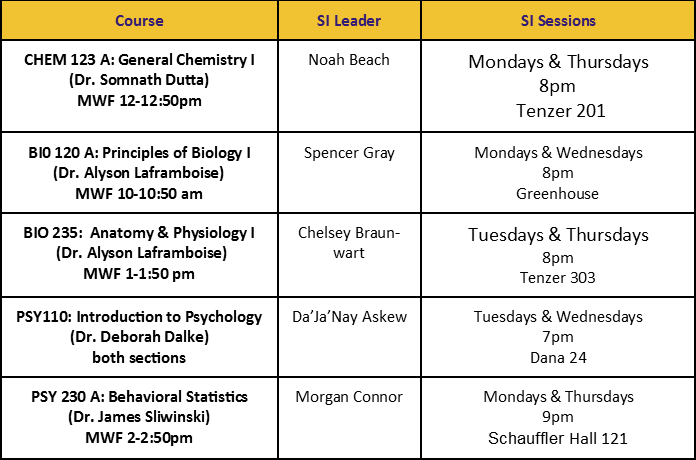 The SI sessions allow the leader to facilitate group study strategies and collaborative study techniques specific to a course. During a typical SI session, students compare and clarify lecture notes, review textbook readings, and discuss key course concepts. SI also provides an opportunity to complete study activities, such as practice quizzes, while developing study skills specific to the course. Why would you not use additional resources when taking a historically difficult course? **Data consistently demonstrates that attending six or more SI sessions during a semester will significantly increase your course grade!